When an appliance is powered by electricity, it simply means carbon is being burnt. Today, people are gaining a wider understanding of the importance of energy consumption and it has indeed become the need of time to choose appliances that consume less energy. Improving the energy efficiency of products and appliances in industrial, residential, and commercial sectors has vital environmental and economic benefits. The Energy Star rating is an international standard for measuring that efficiency of a large range of appliances and equipment such as refrigerators, industrial motors, televisions etc. Products or appliances that carry the Energy Star rating enables consumers and businesses to save money and at the same time, protect the environment too. In simple terms, the more number of stars a product has, the higher is its efficiency. The product has to perform as per the demand of the consumer while providing increased energy efficiency. The appliance must contribute to substantial savings of energy. The energy consumed by the product can be measurable and verifiable. If the product is more expensive than lesser energy efficient ones, the consumer must be able to save on the utility bills while using the Energy Star rated product. The Energy Star rating on appliances simplifies the selection of energy-efficient products. Here is what you can expect. Motors: Most electrical appliances have one or the other kind of motor integrated in its design. Energy efficient motors give the same output strength as any other motor but they consume lesser amounts of power. These motors have reduced fan loses, optimized air gap between the rotor and stator, more copper in the windings, higher quality and thinner steel laminations in the stator, a greater length, and closer matching tolerances. Washing machines: Washing machines utilize a lot of energy for heating the water. Energy Star rated models are designed to consume less water and hence less energy, and use half the water and energy as non-efficient models. Dishwashers: Dishwashers with Energy Star rating typically use 10 gallons less water per load when compared to older models. The advanced technology of these dishwashers also means that the need for pre-washing or post-washing is minimized. Dish washers with an air dry option are highly efficient. Refrigerators: Modern, energy efficient refrigerators have advanced compression and insulation systems. 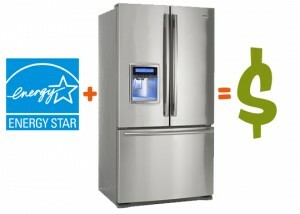 Replacing an old cooling appliance with new Energy Star refrigerators can bring about 20 percent more efficiency and greatly decrease the yearly utility costs too. A major percentage of electricity in the world is being generated from nonrenewable resources like petroleum and natural gas. Therefore, the importance of saving energy goes well beyond simply cutting down on electricity bills. Renewable resources can be harnessed to meet the power needs of all nations. Energy efficient products ease the pressure on existing resources so as to expand their longevity. Water is a limited and valuable resource. Even in areas where water shortage is not a problem, it takes quite a bit of energy for processing and pumping it to the required places – billions of kilowatt hours are being consumed every year for this. Replacing old appliances with Energy Star rated products can yield high savings annually not only for an industry or a home, but for the nation as a whole. Energy Star rated products can save you a substantial amount of electricity every year. These appliances use less water too, saving you water and also the energy that may be used to heat the water. Electricity bills of both industries and homes are steadily increasing year by year. Bottom line, anything you can do to lower your energy consumption will have a positive impact on your budget. Author: Sandy is a blogger and a review writer who writes on various industrial products and supplies. She at present blogs for Gajindustrialsupply, a global ecommerce retailer of high head pump, jet pumps, three phase induction motors, water pumps, air compressor, corrugated box and more.